It is one of the least expensive and most effective ways to diaper a baby. The fact that you have to do some folding is what turns some people off, but it honestly is a pretty quick system once you get it down. We’re both pretty fast, but Mark can change a diaper in under 30 seconds. He’s like a diaper wizard. 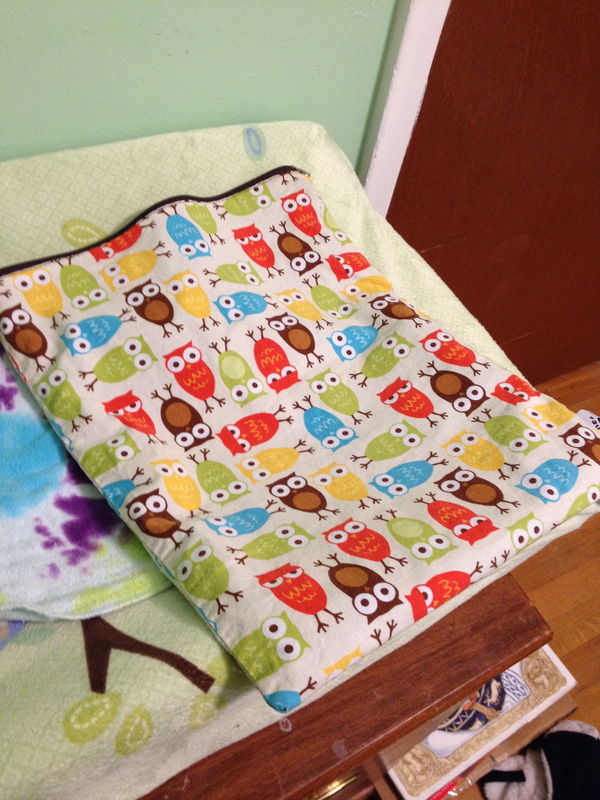 Cloth wipes – I just used the lot of Nuby washcloths we got from numerous people at our shower. You can cut up old t-shirts, flannel blankets, fabric scraps, etc. WIPES DON’T HAVE TO BE EXPENSIVE! I could probably have gotten this cost down too had I known what was going to work the best for us, but even “splurging” a bit, I’ve still saved around $2000 versus disposables. I got fantastic deals at the outset by making an Amazon Baby Registry and using a lot of gift cards. This was a great option because my friends and family who weren’t interested in cloth diapers could still give me gift cards, and I got a completion discount on remaining registry items. Create your own Amazon Baby Registry HERE. 2. THEY ABSORB AND KEEP IN EVERYTHING. NO BLOWOUTS! In the early days when Little Man nursed exclusively, he had those infamous, explosive mustard poops. He was in newborn disposables until he was 3 weeks old, and that was the ONLY time we ever had an issue with “blowouts”. I’d heard this term from friends before and figured it was a normal part of having a baby. Those poops where it goes up the back and gets all in their hair and all over the bed? Yeah, we never had those in prefolds. 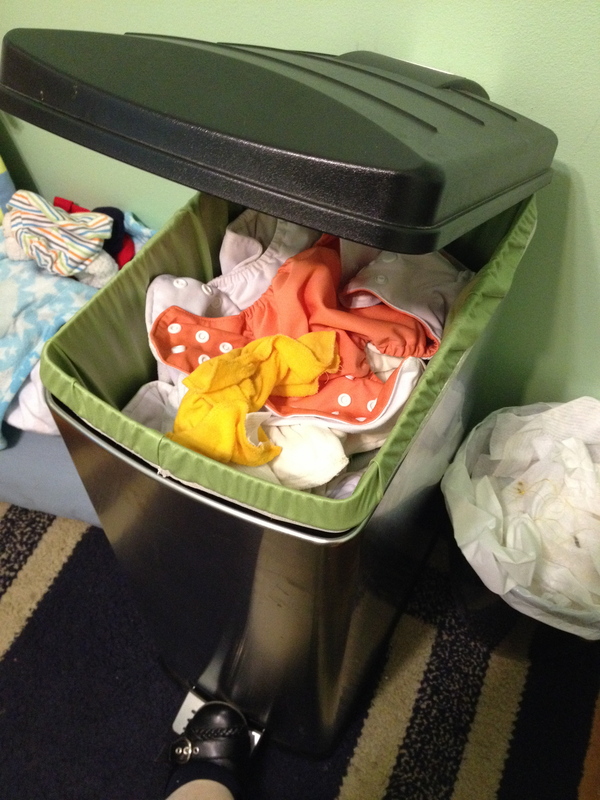 The problem with disposables, and the problem I have with pockets and other AIO style cloth diapers, is that it’s only a one-step containment method. If the fit isn’t nice and tight around the legs and waist, there WILL be leaks of all kinds. With prefolds, if the poop breeches the cloth portion it still has a chance to be caught by the cover. That isn’t to say that you’ll NEVER have a blowout (Little Man has had exactly one, but that was a 500 year poop flood), but your chances are significantly less. 3. THEY ARE EASY TO WASH.
Prefolds are sturdy, so they can take abuse in the wash that more complicated diapers can’t. The wash routine can therefore also be very simple. Check out our washing routing here! 4. THEY PACK AND TRAVEL WELL. A stack of about 24 prefolds, a tub of cloth wipes, the covers, and the wet bags take up less space than the same amount of pocket or AIO diapers. It’s also nice that they can fold up small in a diaper bag. I have a fairly trim Skip Hop diaper bag that bulks out with pocket diapers in tow. If you’re scared of using them while out of the house, fear not! Check out our daily travel routine to take some of the mystery out of it. 5. THEY ARE EASILY CUSTOMIZED FOR FIT AND ABSORBENCY, ESPECIALLY AT NIGHT. You can use doublers, extra inserts, and more to get the fit and absorbency you need. Check out our nighttime cloth diaper solutions to see how we keep a heavy wetting toddler dry all night long! What do I need to get started using prefolds? 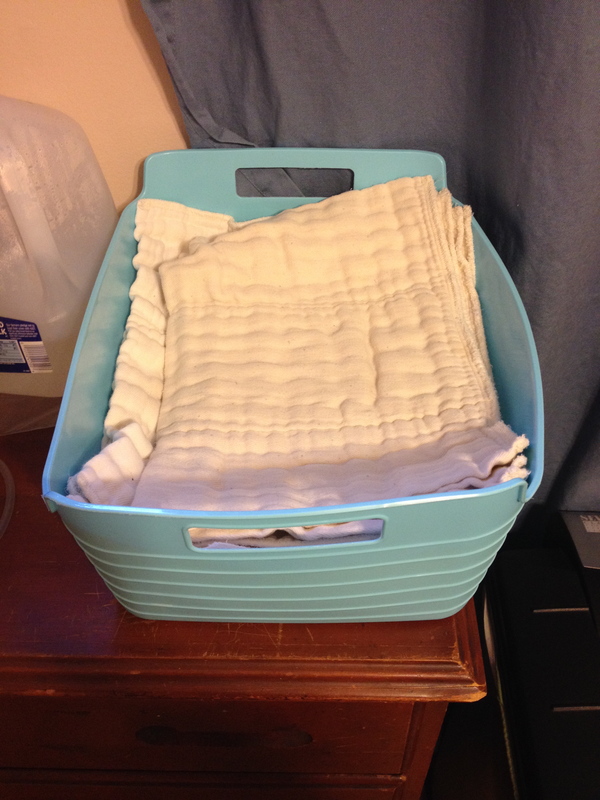 Laundry containment: Can use hanging wet bags, diaper pail with reusable liners, laundry bags, etc. If you need a diaper cream, I have been a big fan of coconut oil. We used California Baby off and on and a few “safe” commercial creams, but when it came down to it the only thing that got rid of rash was plain coconut oil. I also had great success making this all purpose cream that worked not only for diaper rash, but for chapped hands, lips, flyaway hairs, and more. Get the recipe here. What is the basic routine? 1. Remove soiled diaper from the baby. If it has poop on it, you can dump it in the toilet (for solids) or just put it in the pail as is (for breastfed poop only). 2. Clean the baby’s bottom using a cloth wipe (I keep mine pre-moistened in an old wipes container, but others prefer to keep a spray bottle of water and simply spray the dry wipes right before use…your choice here!). Put wipe in the pail. Note: You see me fold down the front/back because it’s a little big on both Doggie and on Little Man right now. When baby is smaller, you can fold both the front/back, then gradually decrease one or the other until it’s not folded at all. 4. Fasten to the baby with fastener of choice (if you just lay a tri-folded diaper in the cover, you don’t need a fastener…I’m not a huge tri-folding fan though so I stick with my Snappis). 5. Put the cover on over the prefold. Make sure the cloth is completely tucked in to the cover to avoid leaks. Keep it simple and don’t be afraid to play around with your routine to find the right fit for you and your machine. Check out what we do at laundry time here. Once you get a routine down, it’s really pretty easy. I’d never want to do anything else! Those few times I had to stare at the wall of disposables wondering what the heck to buy, cost per diaper, what size to get, etc. it was really annoying and nerve-wracking. So much easier to just have prefolds on hand and never have to wonder if the fit is right or if I have enough. No emergency trips to the store for more diapers! Ready to dig into the world of cloth diapers and prefolds? Check out how we set up an easy changing station with furniture we already had, or check out other types of cloth diapers to find out what might be best for you. Still on the fence? No problem! Read more about why we chose cloth here. If you need any help getting started, troubleshooting, etc. leave a message below, send an email, or catch me on Facebook and Twitter! I’very been doping the “angel fold” and fastening with a snappi. How do I keep the diaper up higher on her thighs? It ends up so low that very few covers fit. I must be doing something wrong! Hmmm…without seeing it, it’s hard to tell. 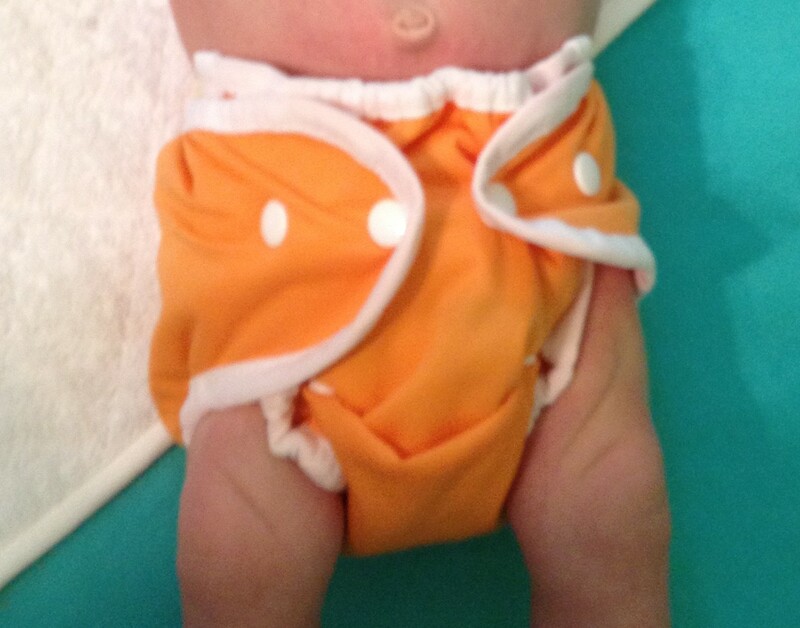 If the diaper is too big/long it may need to be folded up in the front and/or back (if you aren’t already). You could try folding the back of the diaper in more of a triangle shape to get the fabric off the backs of the thighs (see the Ooey Fold here: http://theecofriendlyfamily.com/2009/08/prefold-picture-tutorial/). I also tend to pull the “wings” on the front of the diaper up along the sides of the hip bones (sounds silly, but think like those high-cut 90’s swimsuits) rather than straight across the waist, which can help. Also, If there’s a lot of fabric hanging out of the leg holes from the thighs, you can try rolling that part of the diaper in along the legs as you fasten it with the Snappi. I never had the thigh issue with my son because he has a long build, but my sister-in-law had this issue with my niece. It may end up being that you need to try a different fold all together (Ooey, Jelly Roll, or Bikini Twist might work better) or just play with it a little until you create a fold that works for you. Every baby is built so differently! Good luck! What do you do when you areout fir the evening? do you use disposible diapers? how do you carry your cloth diapers? This is super helpful! Thank you so much! I’m finding that folding then prefold front and back is making it very bulky and impeding hip movement ie: in disposables my baby’s could bring his legs all the way in. Now he can’t, is this totally normal? Totally normal, especially depending on the physical traits of your baby. For example, my baby had these little skinny legs so the extra folds never really impeded his movement, but my niece had thicker legs and sometimes had a harder time with so many folds. One thing you could try is instead of folding the front AND back, just do a much longer fold in the front OR the back and not both, then experiment with different ways to pull those corners in to keep the hips freer (think like the difference between boy shorts and those high cut 80’s bikini bottoms). It can take a bit of trial and error to find something that works, but it’s worth it. Oh thank you! I remember using cloth diapers on my siblings 20+ years ago and now my own lo. I forgot I needed to fold the back down because she is so tiny…lol. I’m thinking I may need to invest in the snappies and cloth covers in place of these plastic oned….pros/cons of plastic vs cloth covers?